An Orange County pathologist testified on Thursday that Kelly Thomas died a slow and progressive death, that his voice got louder and then decreased until he couldn't breathe. Dr. Aruna Singhania showed jurors autopsy photos explaining how Thomas died of mechanical chest compressions, one after another. She also testified that Thomas was brain dead, the result of a physical altercation with Fullerton police officers. The jury in the trial of two former Fullerton police officers charged in the beating death of Kelly Thomas watched and listened Tuesday to the full encounter between Thomas and officers. Vikki Vargas reports from the courthouse in Santa Ana for the NBC4 News at 5 p.m. on Tuesday, Dec. 3, 2013. The first time Ron Thomas had seen those autopsy photos, he walked out of court. This time he stayed. “No one can ever convince me it's OK to arrest someone like that, holding them from the neck up,” Ron Thomas said. 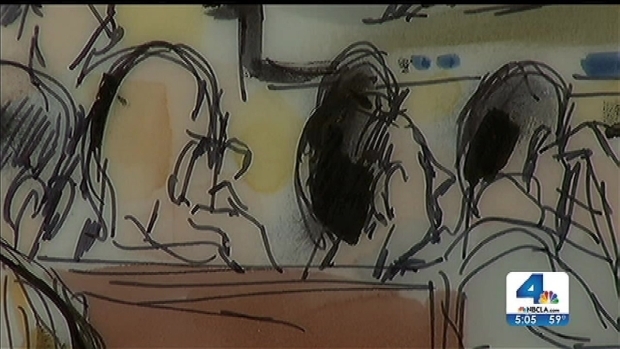 The testimony came in the trial of two former officers who are charged with killing 37-year-old Kelly Thomas. The mentally ill man struggled with six officers in a July 2011 confrontation and died days later at a hospital. A trial got underway in Santa Ana on Monday for two former Fullerton police officers charged in the beating death of Kelly Thomas, a mentally ill homeless man. Vikki Vargas reports from the courthouse in Santa Ana for the NBC4 News at 5 p.m. on Monday, Dec. 2, 2013. Former Fullerton police officer Manuel Ramos is charged with second degree murder. Former Cpl. Jay Cicinelli is on trial for manslaughter and use of excessive force. It is the first time an on duty officer in Orange County has been charged with murder. Singhania, who performed the autopsy, says Thomas died from bronchial pneumonia and from a lack of oxygen to his brain that was caused by his chest being compressed during the struggle. Attorneys provided different views Monday about what is depicted on a surveillance video that will be a key piece of evidence in the case of a homeless man allegedly attacked by two former police officers. Jacob Rascon reports for the NBC4 News at Noon on Monday Dec. 2, 2013. Jurors were shown images of Thomas's bloodied face in the hospital. The defense has argued that Thomas died from overexerting a diseased heart. Singhania says Thomas had an enlarged heart - but that's not what killed him. In a letter sent by Cicinelli's father to the state Attorney General, he accuses the Orange County District Attorney of misconduct. After two years of investigation and a grueling jury selection process, the trial for two former Fullerton police officers accused in the beating death of homeless man Kelly Thomas is set to begin Monday. Adrian Arambulo reports for the NBC4 News at 9 p.m. Sunday, Dec. 1, 2013. He claims the same pathologist changed her story after meeting with prosecutors agreeing to list the cause of death as "compression suffocation" and from "unknown" to "homicide." 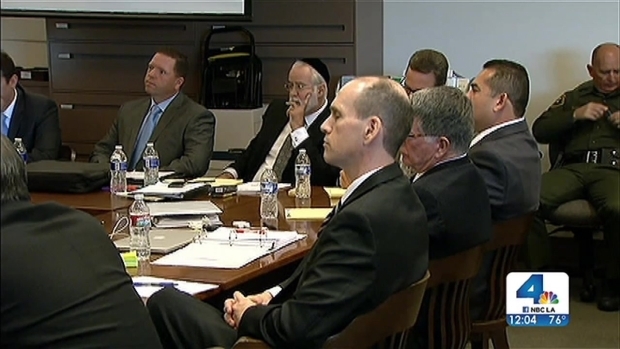 Defense attorneys asked the pathologist how she could be sure the officers' actions led to Kelly Thomas' death. “In his statement Cicinelli says he had no other option but to beat Kelly 's face to hell. What about handcuffs? He never tried those,” Ron Thomas said. 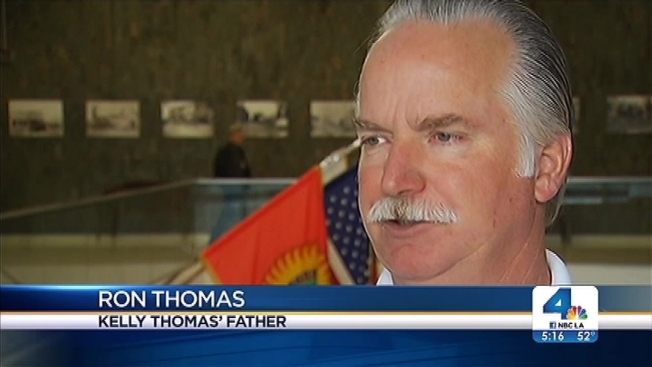 Thomas, whose father said had schizophrenia, was fatally wounded July 5, 2011. He died after being removed from life support five days later. Police went to the Fullerton Transportation Center the night of the beating in response to a 911 call from the nearby Slidebar nightclub that someone was trying to break into cars outside the club. Investigators later determined Thomas was not responsible for the car break-in attempts. A third officer, Joseph Wolfe, faces charges in a separate trial.